This is incredibly creative! Thanks, Beth and the American Cancer Society, for jump-starting my brain this morning. thanks for this, very helpful, I am thinking if you can join earth cancer society, because I noticed that you are interested in cancer topics, maybe you can give some advice to the believers. I call cancer patients believers, because I want them to believe that they overcome this challenge. 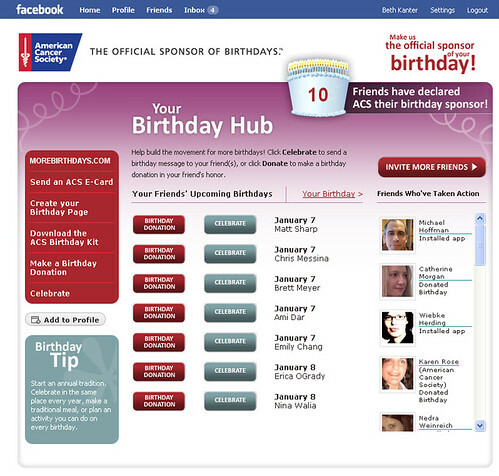 There is no doubt that Social Media Marketing can be extremely efficient for fundraising initatives. Mainly because non-profit movements usually stimulate an emotion and it is this emotion that triggers people to share it with friends thus creative a movement. Great article and a very creative campaign! Good work!